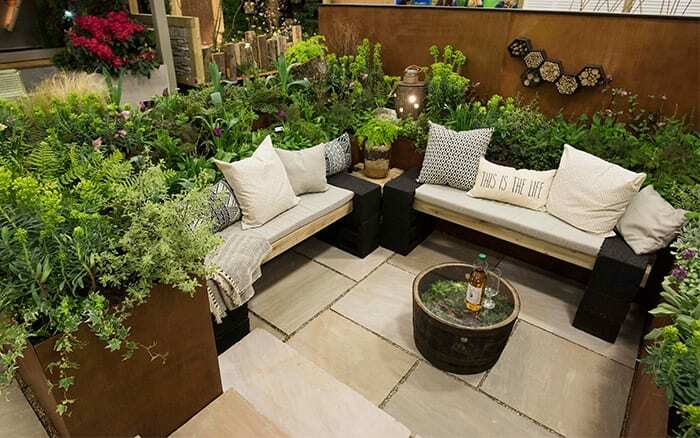 Get genius garden design ideas from the Ideal Young Gardeners of the Year competition! 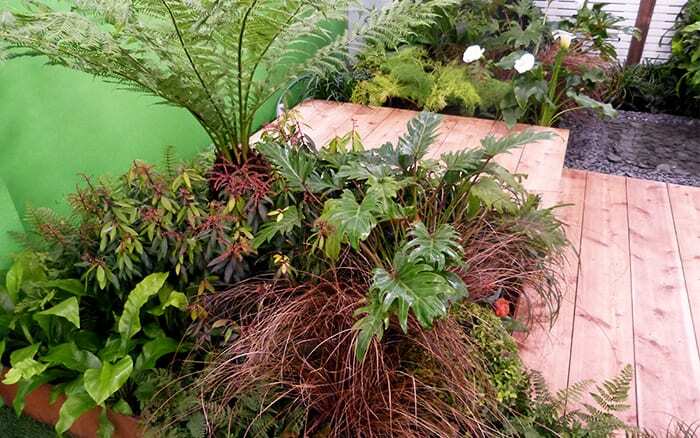 The annual event sees horticulture students from six UK colleges design show gardens in small spaces. 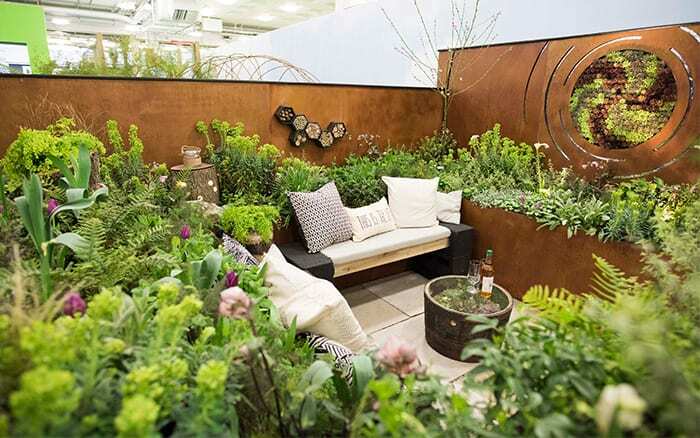 The stunning results will inspire visitors with clever planting and landscaping schemes, as well as design tricks to make the most of small gardens. 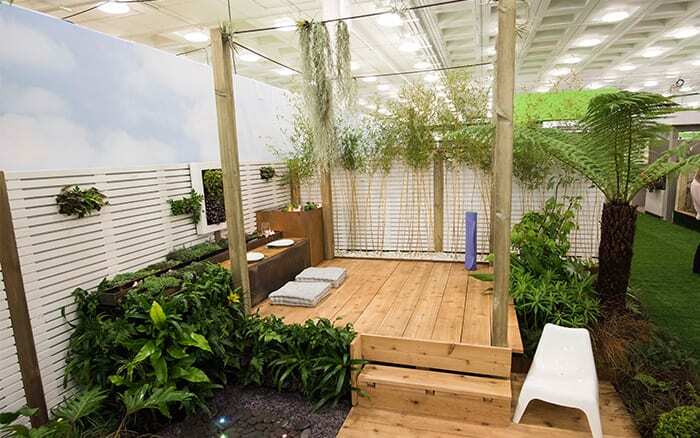 Read on for the best garden design ideas from the 2016 competition at the Ideal Home Show. 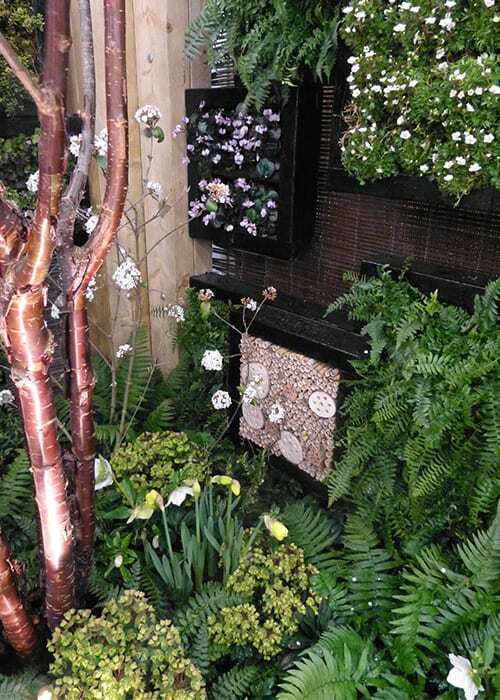 And see the gardens on display from 18 March – 3 April. 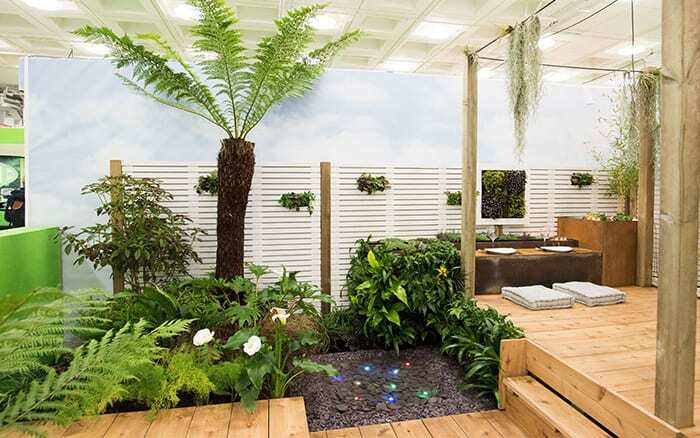 Capel Manor College students created a tropical paradise on the theme of a yoga retreat. It’s a really open design with plenty of decking space for yoga. The timber is Western Red Cedar, chosen for its beautiful colour. The trees used to make this were felled on a college-managed site and cut by horticultural apprentices, but it is commonly available to buy. 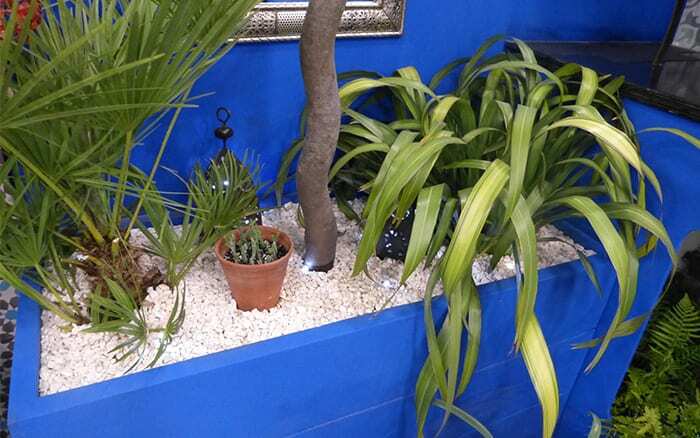 The lush feeling comes from the tropical foliage plants. If you have a sheltered garden you may be able to grow the Dicksonia antarctica tree ferns as long as you protect them from frost. 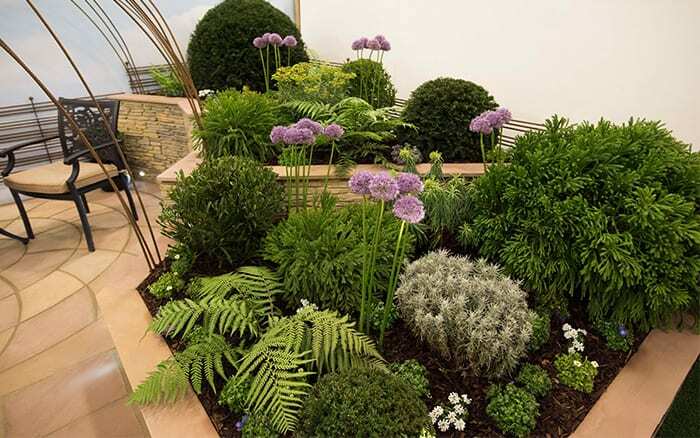 But anyone can put in leafy varieties like ferns, fennel, fatsia japonica, aspidistra and Euphorbia mellifera. Students used a limited colour palette to create a relaxing cocoon feeling. Most of the plants are leafy green with orange tones in the wood and echoed in the low-growing tulips. Uncinia rubra black grass adds a subtle darker tone to the planting. 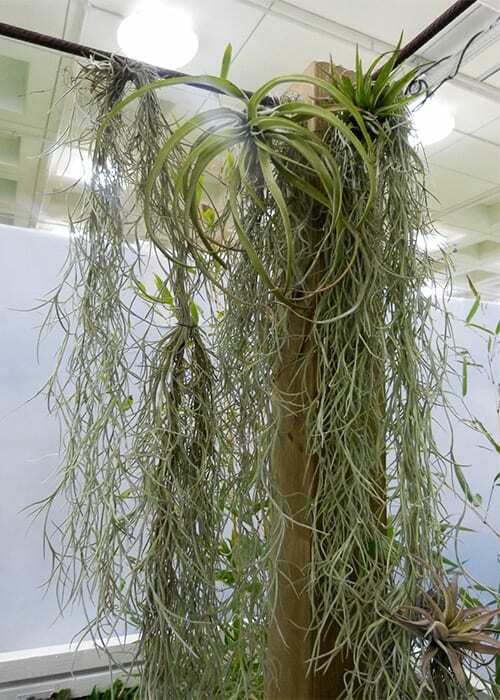 Students also hung tillandsia or air plants from the pergola. These amazing plants have no roots – they absorb water and nutrients from the air! Read more about air plants here. Another great design element is the use of still water to create a feeling of calm. 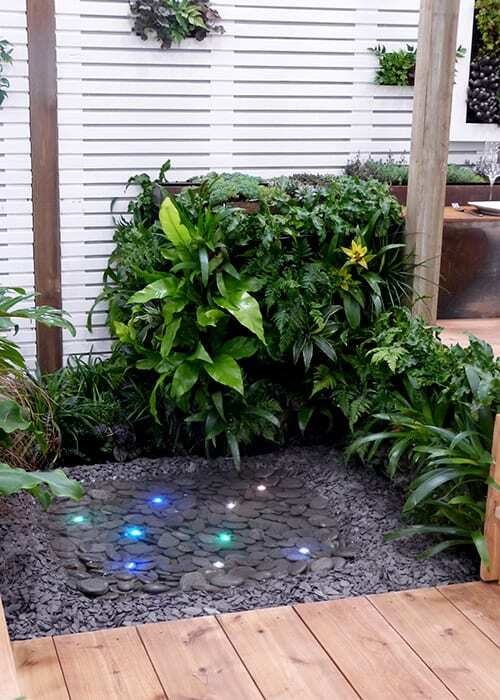 One still pool sits in slate gravel with colourful lights underneath. Above the decking is a long rusted steel water rill and square basin. This is made to feel lush with candles and pond plants. 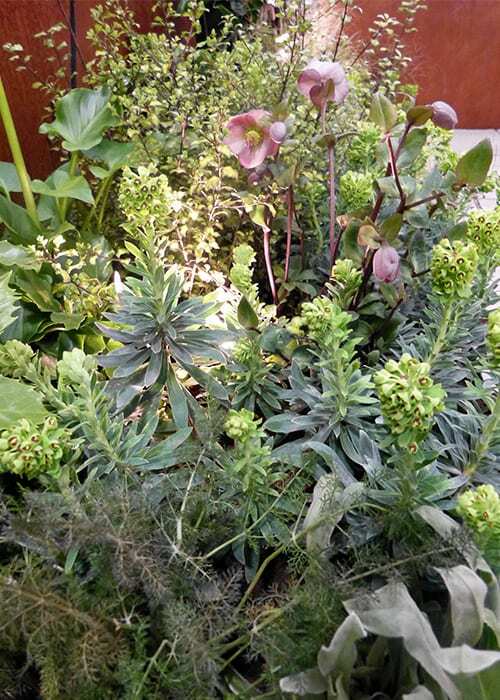 The garden features succulents and alpines planted around the rill and into a vertical wall planter frame. 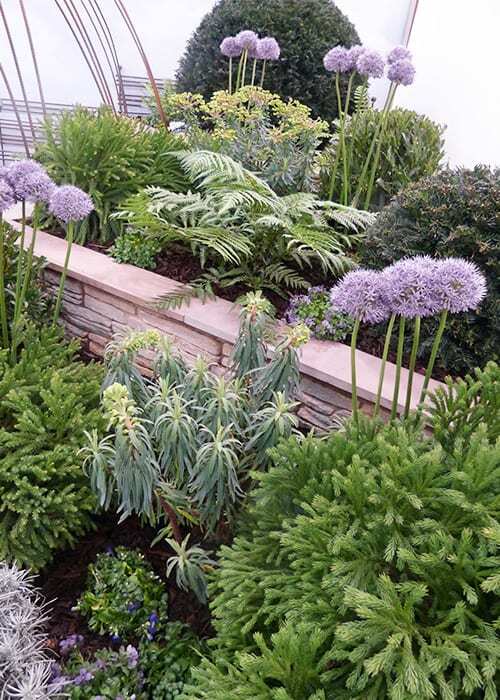 These are great low-maintenance plants and ideal for adding colour up a bare wall. Students also played with lines against the fence, with upright stems of yellow bamboo contrasting against the horizontal white fence slats. Create this bamboo screen by picking off all the lower leaves. Be sure to plant bamboo in a container to control its roots and runners, or it will take over the garden! Find out more about Capel Manor College’s garden here. 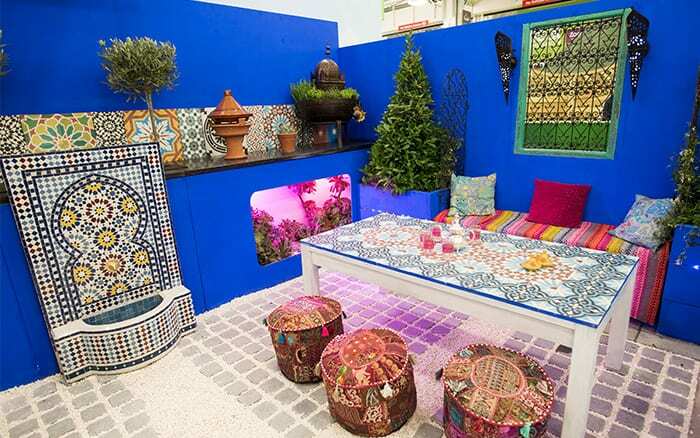 Students from Shuttleworth College designed a Moroccan-inspired show garden. 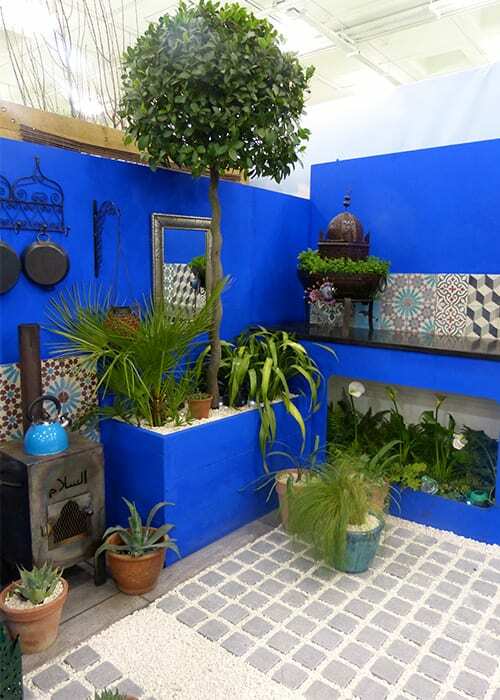 The blue colour is named after the country’s famous Majorelle Gardens. The structure is a Chahar Bagh, a Persian style where the space is divided up into four areas. 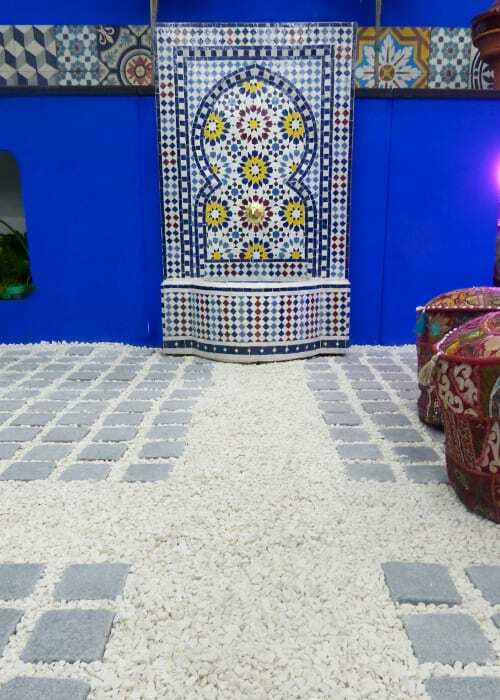 This is achieved by gravel separating four areas of cobbles. The same gravel is used to top-dress the containers, which helps retain moisture and stop weeds sprouting. 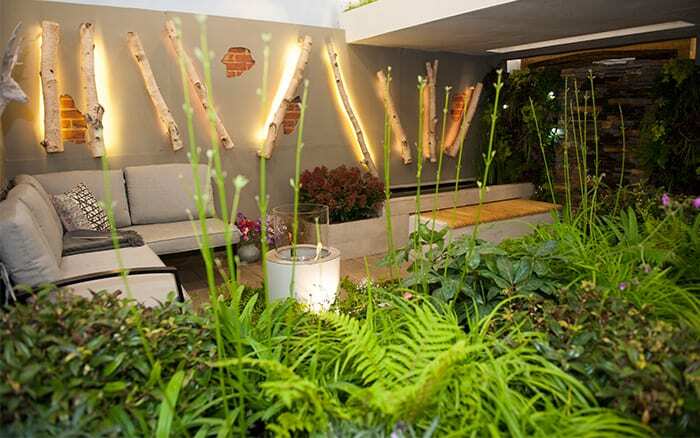 This courtyard garden is immensely versatile because the boxy planters are on castors, meaning they can be moved around. 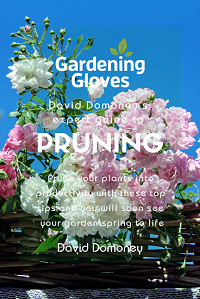 You could also bring them into a porch over winter, making them ideal for growing tender plants. 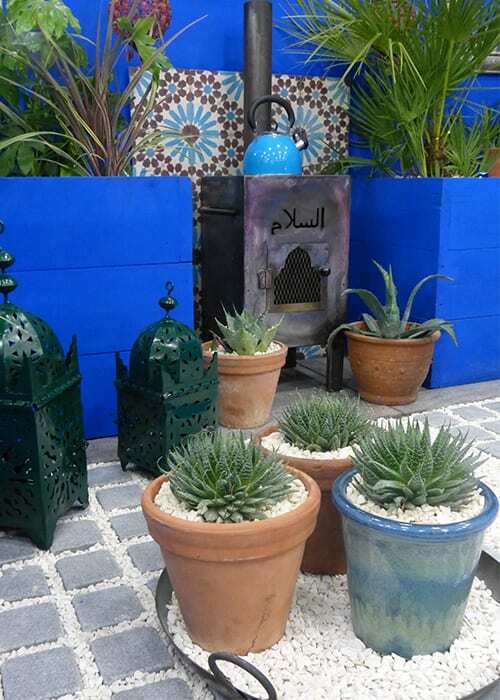 The garden features Mediterranean plants grown for their architectural silhouettes, such as phormiums and bay trees clipped into pyramids. 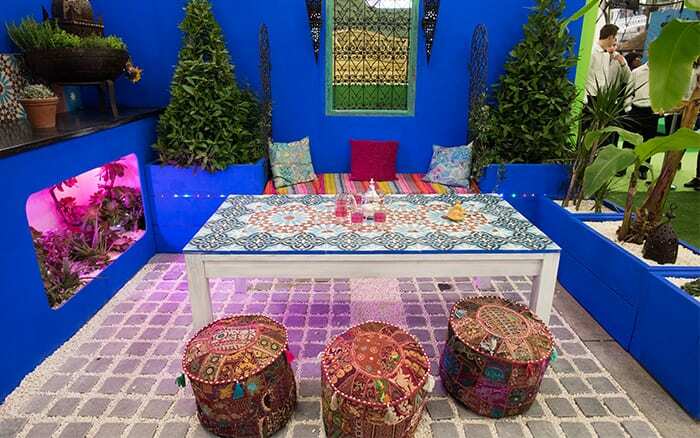 The design makes great use of Moroccan tiles on the back wall and table top. And it has a stunning fountain display. 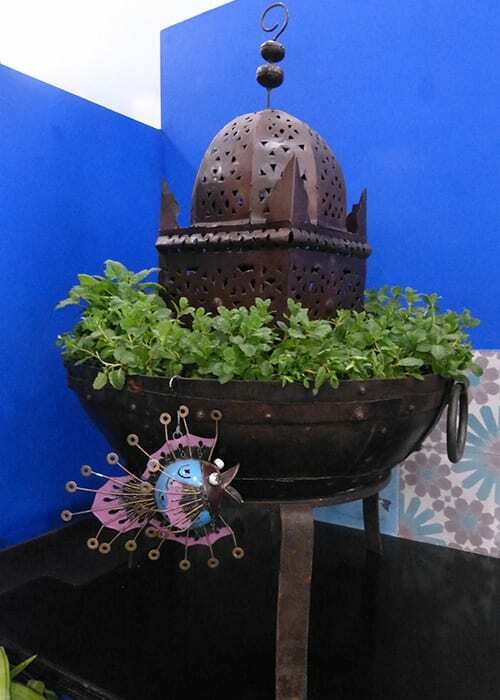 The students chose a range of furnishings and metalwork with intricate details to complement the theme. The garden is run entirely on solar power, from the lights to the fountain. Solar panels are a cheap and sustainable way to power a garden and this is a great example of what they can do. Solar light bulbs illuminate the garden, from decorative bulbs set into planters to flickering white lights buried in the borders. The garden has an outdoor kitchen element too, including a wood burner and drinks cooler. 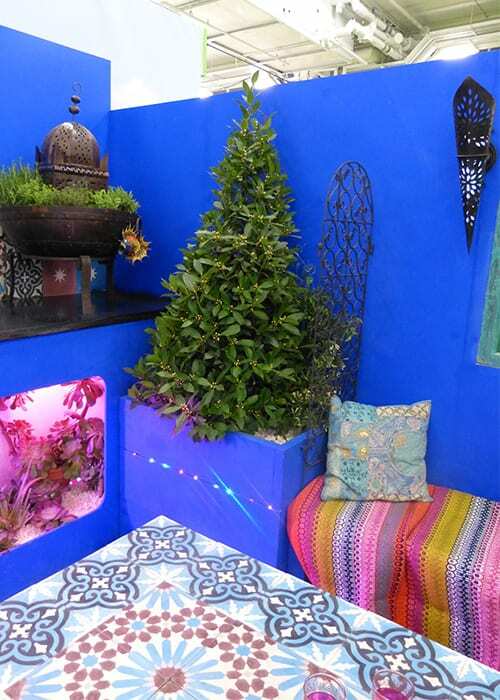 Two clipped olive trees sit against the back wall between fire bowls planted with salads and herbs. Find out more about Shuttleworth College’s garden here. 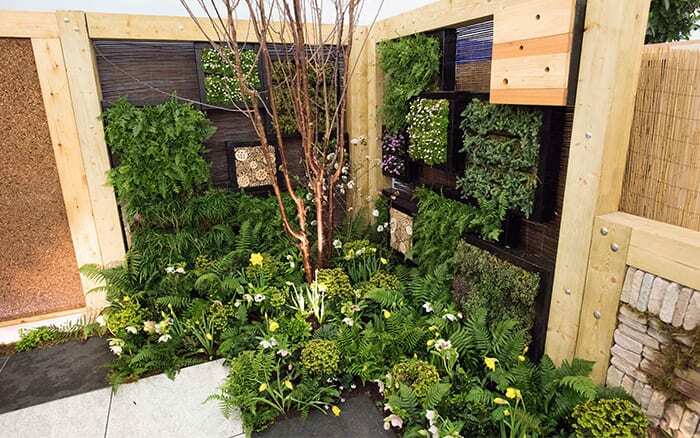 Chichester College students created a courtyard garden on the theme of maths, specifically the number three. Each side of the garden is divided into three raised beds, going up in height one side and down the other. 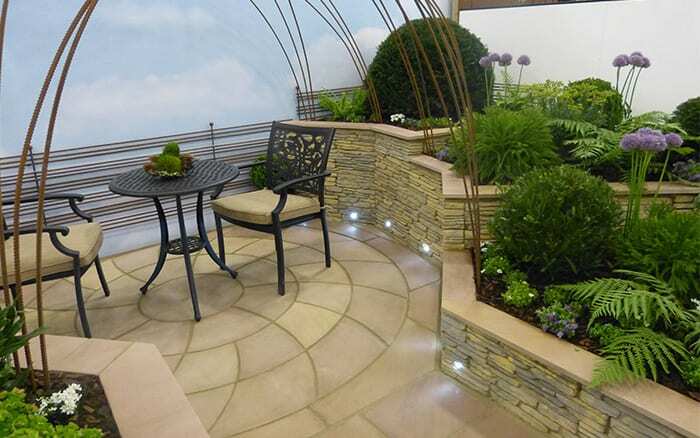 The classic hard landscaping includes dry stone walling and a spiral patio in natural sandstone colours. Students said they wanted the garden to feel elegant but uncomplicated. 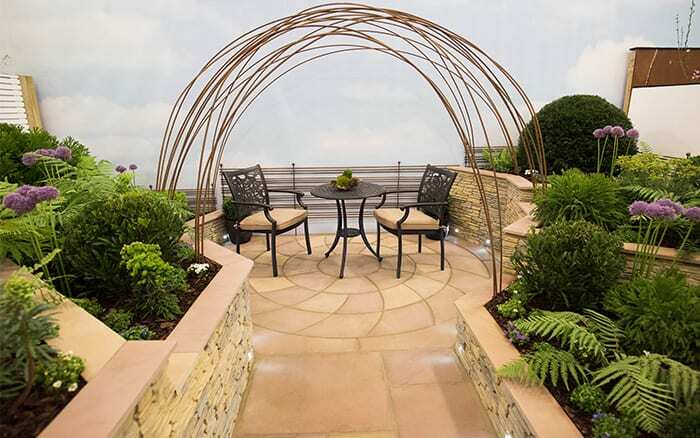 The centrepiece of the garden is the rebar dome which covers the seating area. 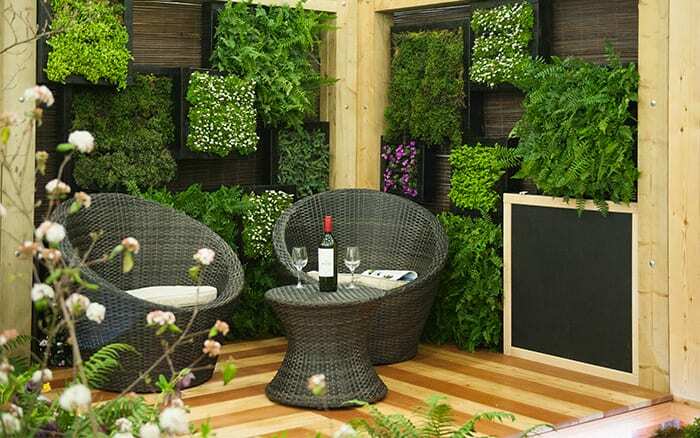 It creates privacy for the garden owner and could easily be used to grow climbers. And the rusted metal is echoed in the simple fencing, which creates a naturalistic feel. 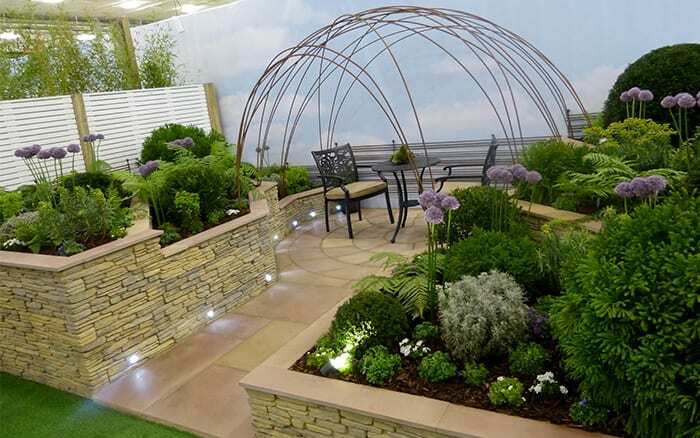 The garden is designed to be low-maintenance for people who are too busy to maintain a demanding garden. This even includes the cast aluminium furniture, which can be left outside all year round without being damaged. And the planting is full of hardy evergreens. Many plants have been clipped into spheres to create shape and balance, including bay trees and cryptomeria. 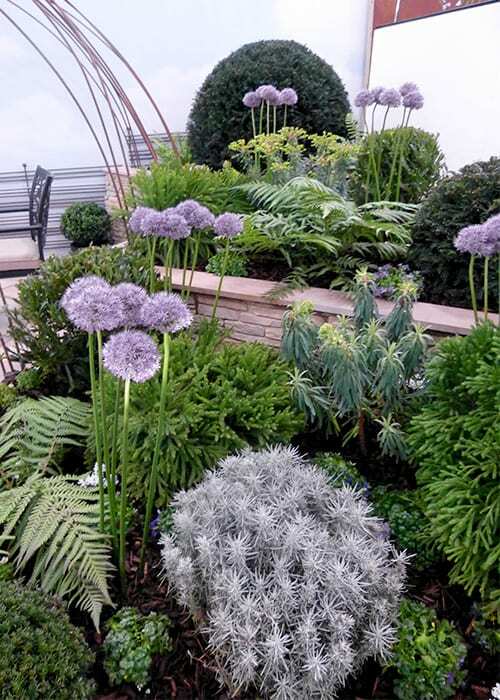 Ferns give a lush green leafiness and purple alliums bring height and shape. Small bedding plants add pops of white and purple colour too. 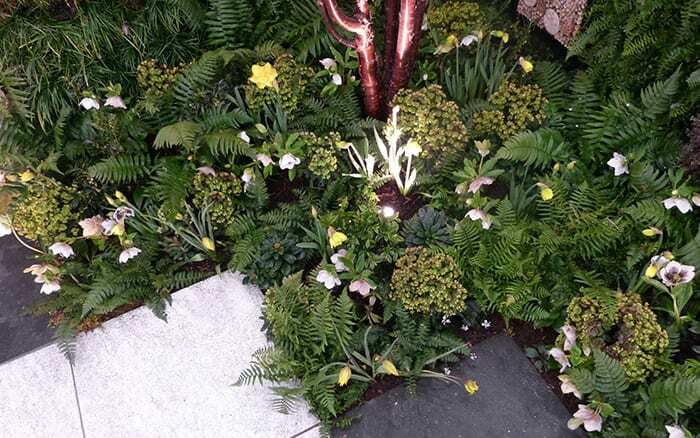 The plants are arranged in groups of three and planted in mixtures of foliage for a subtle effect. And the soil is topped with bark chippings which help retain water and suppress weeds. Lighting also has a striking effect in the garden. 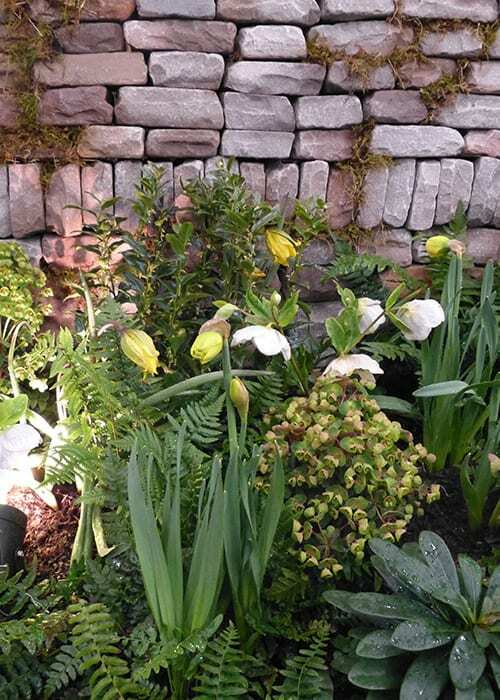 Spotlights in the beds pick out plant details and the path is lined with feature lights in the walling. Find out more about Chichester College’s garden here. 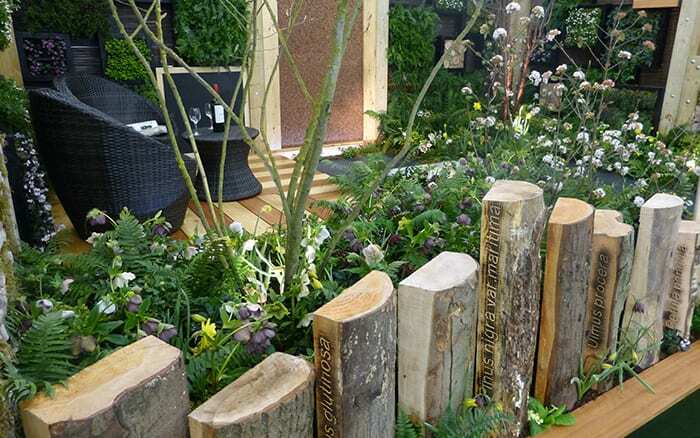 Students at Askham Bryan College designed a contemporary woodland garden. 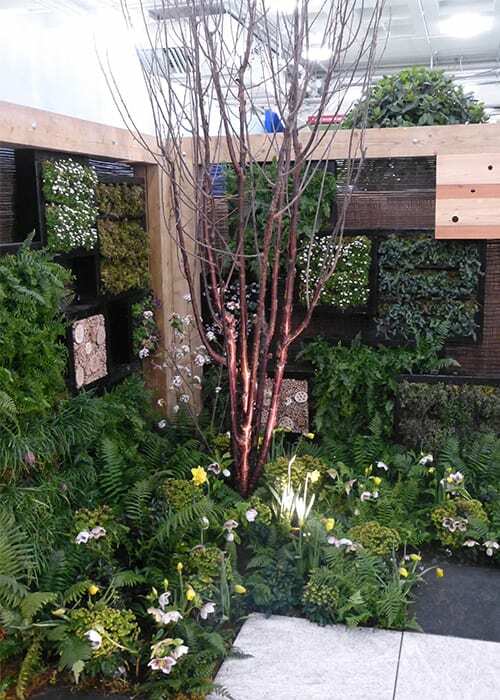 Timber was a big feature with trees and shrubs including viburnum and prunus serrula (ornamental cherry). The stunning fence was created by felling different varieties of tree. The trunks were cut to leave the bark intact and the tree name was carved into the side. It’s a great showstopper design feature. 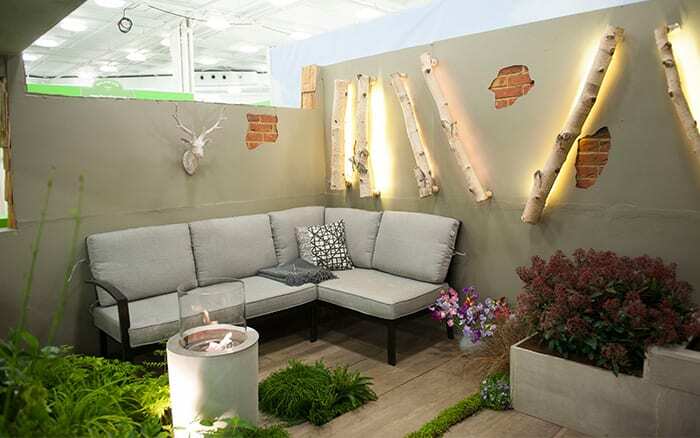 The seating area is also on a wood theme. The decking is made with birch and balau, playing on the contrast in the timber colours. 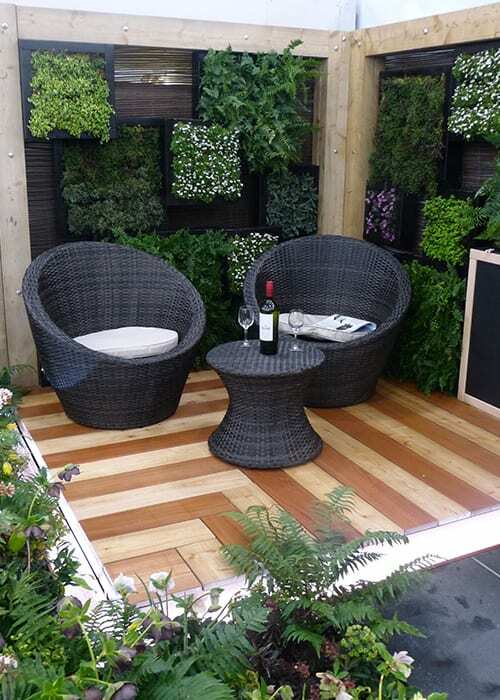 Black bamboo screening creates privacy and complements the rattan tub chairs. 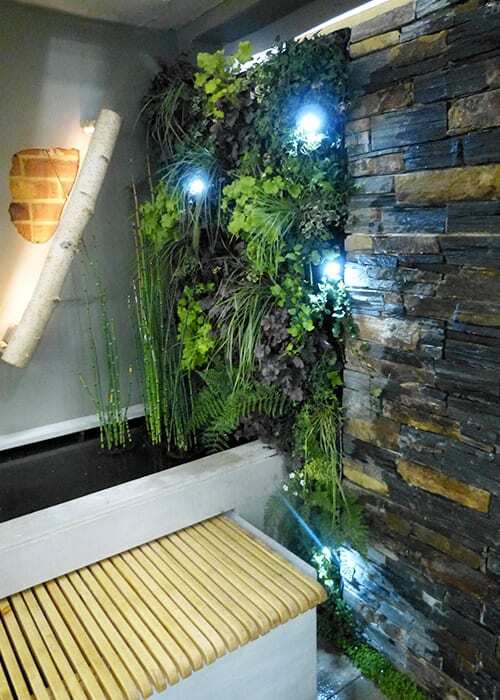 The decking also has a sunken copper rill around the edge lit with rope lights, which would make a stunning feature on an evening. 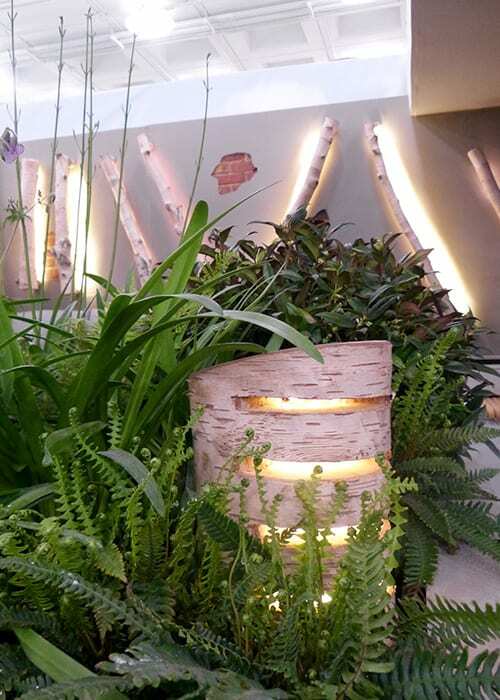 And spotlights pick out feature plants and decorative bark within the borders. The garden is framed by large timber joists and features panels of stone walling dotted with moss. The whole garden has a contemporary black and grey colour scheme. 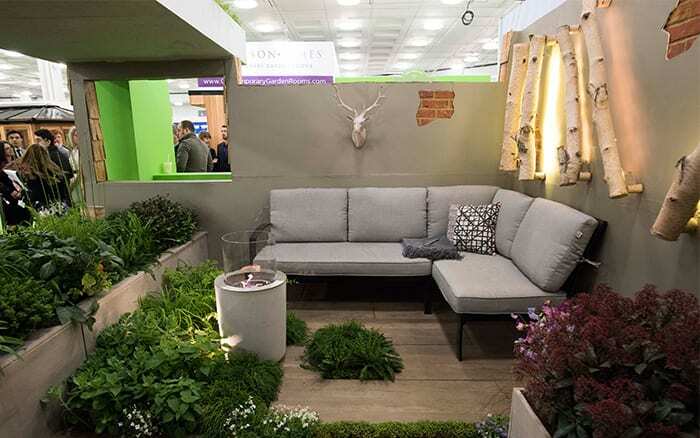 The planting fits with the woodland theme and is easy to recreate at home. It’s also perfect for a shady garden as woodland plants grow happily under trees. Pale whites and yellows bring light to the dark right-hand corner, while darker reds and purples on the left add colour to the seating area. Ferns and euphorbia create a green backdrop to highlight the stunning hellebores in white and dark purple. Tulips, daffodils and cyclamen add more spring colour. Once these flowers fade you could simply fill in gaps with summer-flowering varieties. 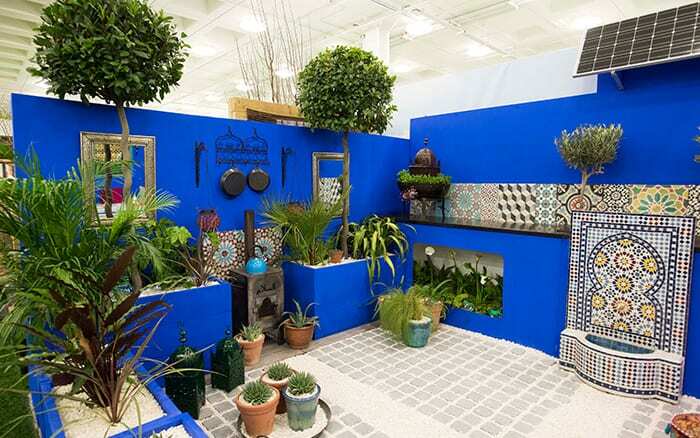 The green walls are also a great feature. The students made square wall planters from wooden frames filled with compost. The front is covered with chicken wire or mesh and plants are pushed through holes into the soil. 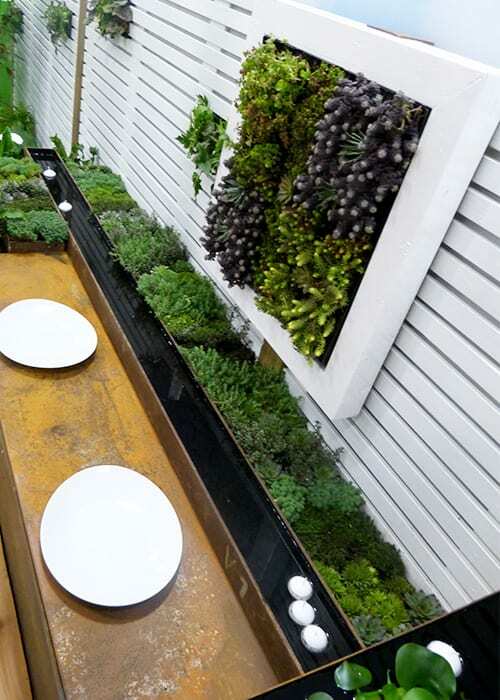 These planters featured leafy ferns alongside culinary herbs. Nestled among these frames are insect hotels and bird boxes to make the garden a home for wildlife too. Make your own insect hotels with this guide. Find out more about Askham Bryan College’s garden here. 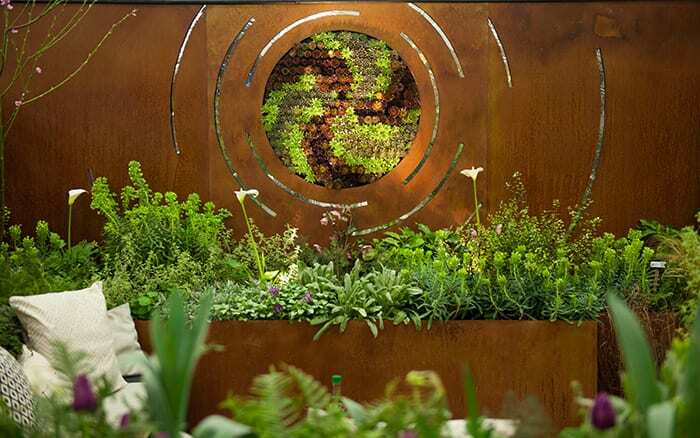 Pershore College students created a garden based on the Fibonacci sequence, showing curves, spirals and patterns in nature. 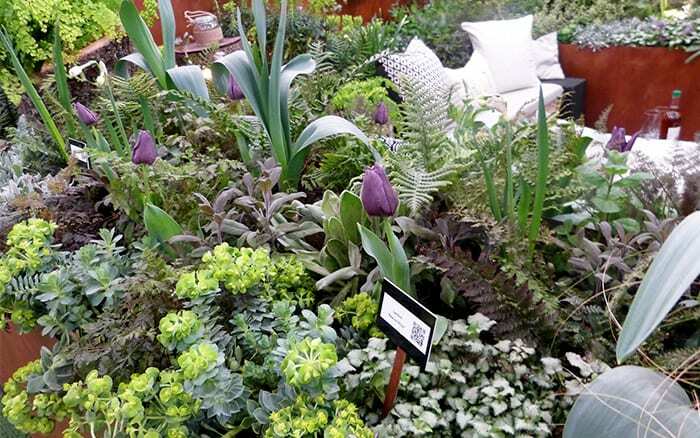 Many plants were chosen for their intricate leaves, including ferns, lamium and euphorbia. Students also used succulents like sempervivums, which demonstrate a spiral pattern with their leaves. They were planted between the steps and into a spiral wall feature, as well as into the half-barrel table. 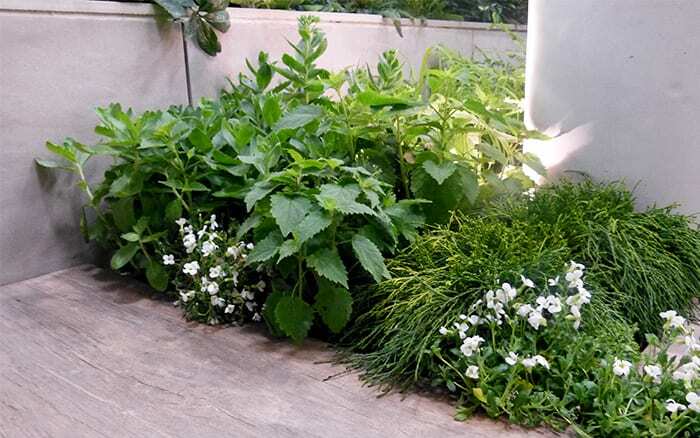 Wispy grasses add texture and movement and culinary herbs are mixed into the planting. Flower colour comes from the white arum lilies, with deep purple tulips and pink hellebores to contrast with the orange cladding. 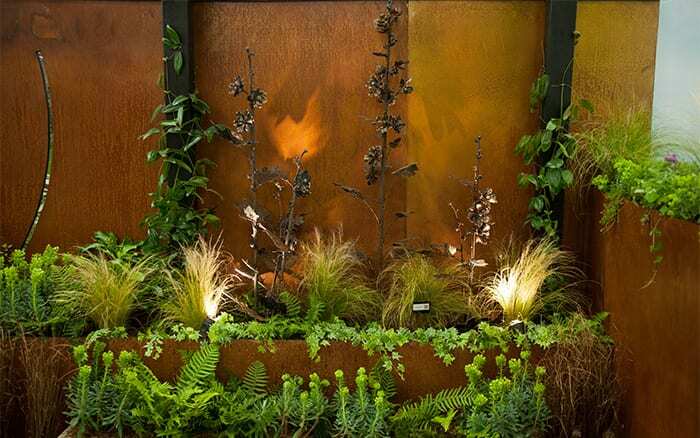 This rusty corten steel cladding is the standout feature. The students made it by creating a rust layer on the surface of recycled steel panels. This gives it an industrial orange tone and will protect the metal from further damage. 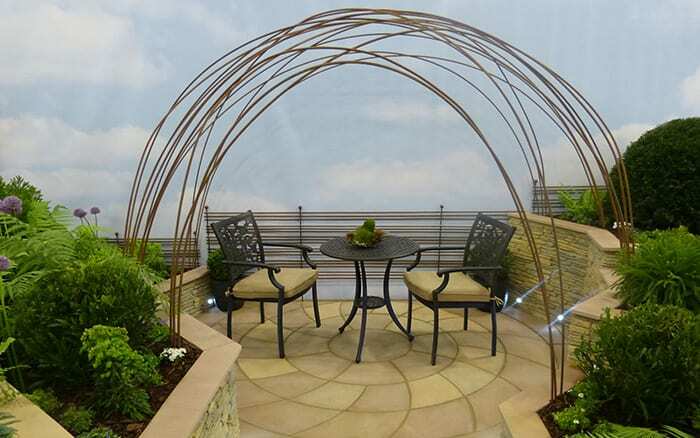 The pergola is also made from steel with a roof based on fern leaf structures. It was designed to cast a pretty shadow on the ground below. Underneath it are steel hollyhock sculptures made from scrap metal. 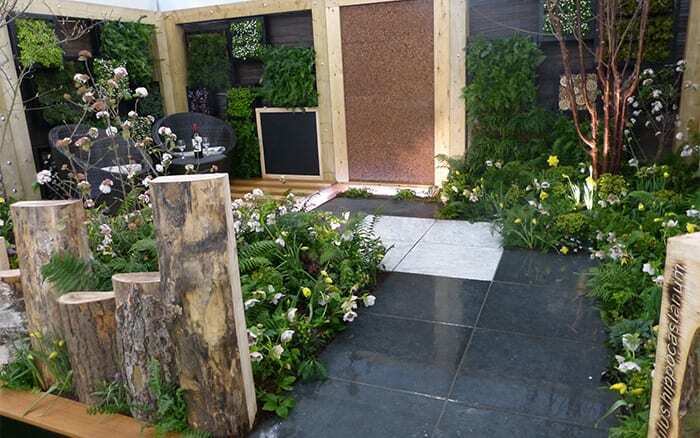 There are lots of other industrial details in the garden, including the benches made from breeze blocks painted black and slotted onto wooden panels. Recycled glass squares were also made into a corner light feature. Many of the garden materials were found in reclamation yards. Lighting comes from spotlights to pick out details, as well as glass lanterns hung with twine and hollow logs drilled with holes and filled with lights. 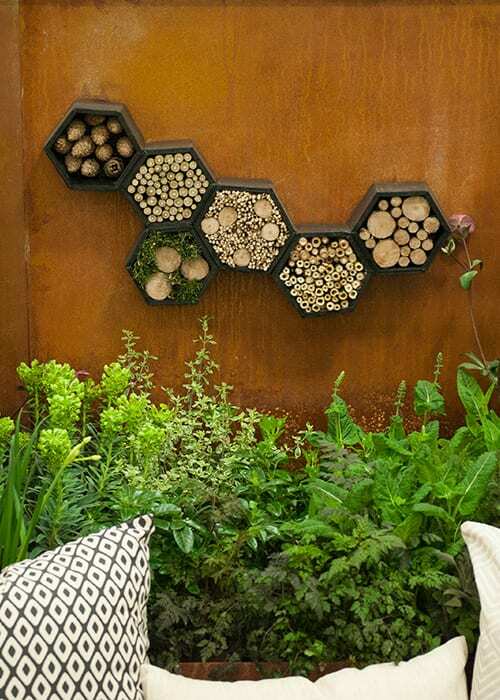 Finally, hexagonal insect hotels filled with a variety of materials offer a home to wildlife. Find out more about Pershore College’s garden here. 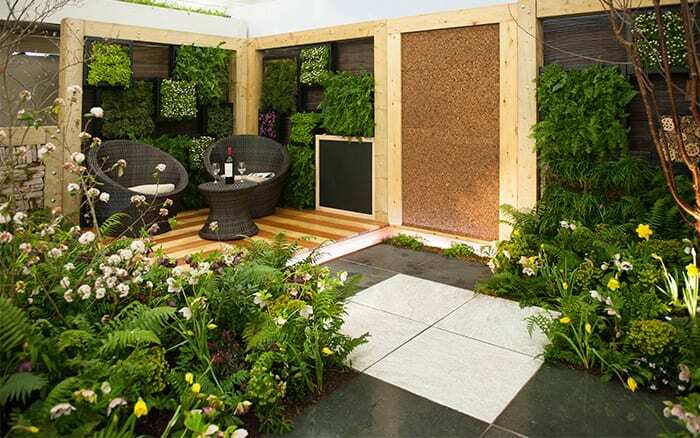 Students from Writtle College have created a basement garden to show what can be done with shaded or covered spaces. The green roof is topped with a meadow grass and planted with small trees. Recycling and sustainability was a big design theme, with many elements sourced from around the college. The main structure was built with Ecojoists, which are web structures that use less timber than solid joists. 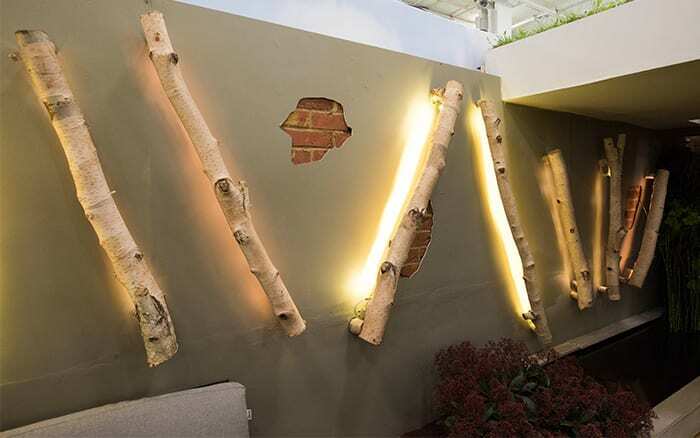 The most striking feature is the lighting, which is made from old silver birch logs and battery-powered lights. Larger logs with horizontal slats are dotted into the flower beds. 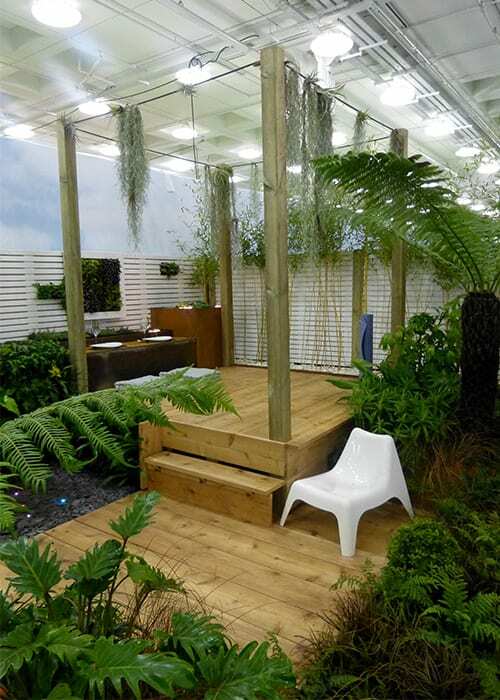 The decking is made with pale grey panels that complement the planters and cladding. 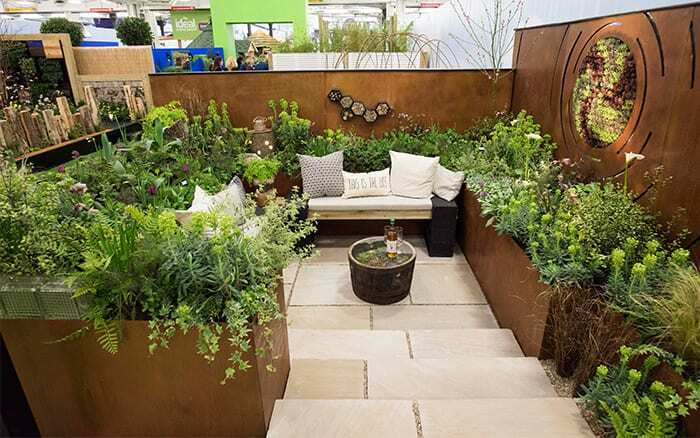 It had gaps for plants including lawn alternatives like thyme, which is good at soaking up rainwater. 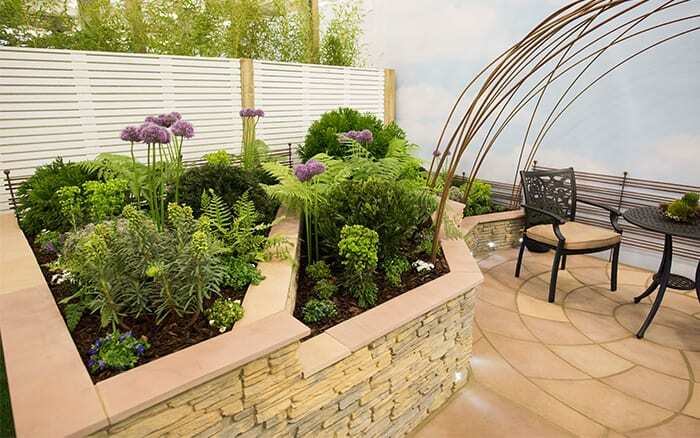 The modern seating area runs around a fire pit to make sure the garden is ready for entertaining. 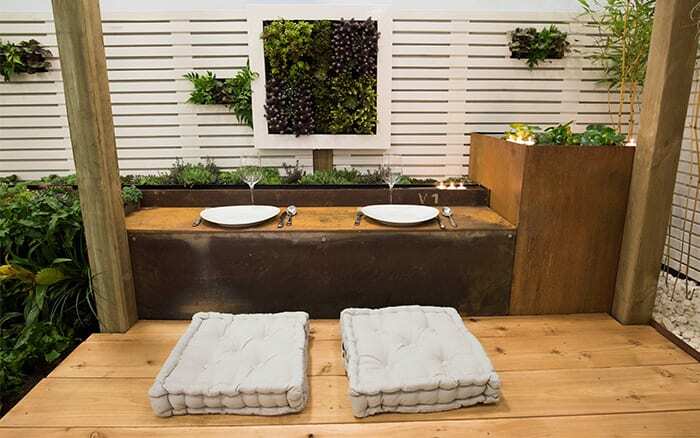 More seating space comes from a bench which slides out from under the shallow water trough. 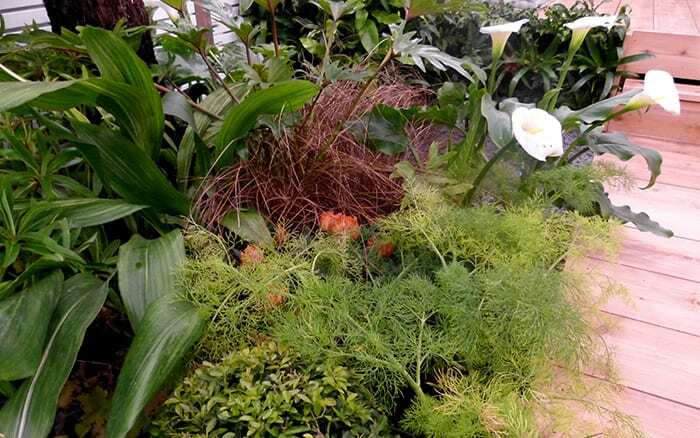 The planting is simple, with greenery and foliage from ferns, grasses and bay. Students made use of feature shrubs including skimmia and a large pink rhododendron. The garden also has tall green vertical planters on either side of a dark stonewall feature. 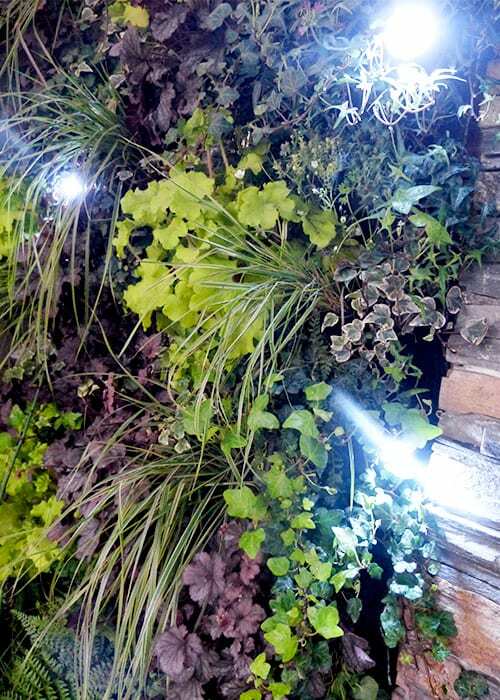 They are planted with ferns, ivies, grasses and heucheras and lit with spotlights to pick out the colour contrast between yellow-green, purple and variegated foliage. Find out more about Writtle College’s garden here.